Lying just outside the Postberg Flower Reserve, which is part of the West Coast National Park, Kraalbaai is a beautiful, lagoon-side space in which to escape, made all the more memorable by the obvious house-boats moored in the shallows on which people stay on a regular basis. It’s a spot to which many head over weekends, and it is especially popular during the flower season and summer. But it never gets beyond measure as the park was established to conserve the Langebaan Lagoon and its surrounds, not to exploit it. It is also the site where 117 thousand-year-old human footprints were discovered in 1995 (‘Eve’, whose footprints they are, is believed to have been 1.2 metres tall) and the lagoon is a Ramsar Wetland Site, its huge expanse of water a wonderful space in which to paddle and swim (it is certainly warmer than the waters of the Atlantic), bar the winds, because, as with much of the coastline, when it blows, it sure blows. Thousands of sea birds use this lagoon as their home, and the golden, curved beaches of the lagoon seem to stretch for miles. During spring, Postberg is opened to the public for the incredible display of rich and colourful wild flowers, some of the best for miles around. 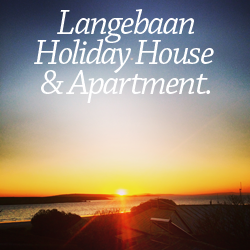 There are two well-known landmarks that make Kraalbaai so recognisable. One is the wooden jetty that seems to jut out of the centre of the white, sandy beach towards the boats moored offshore. The other is the Preekstoel or preacher’s pulpit, which looks more like a modern day cycling helmet to be honest, but nonetheless provides shelter from the south-easterlies that can sweep through here.